← A Fat Tax is a tax on fatty food, not fat people…. Over the past two weeks, the Chinese community have watched nervously as some Chinese individuals attempted to stop 113 students in SM Chong Hwa, Kuantan, from sitting for the UEC exam. The students went ahead with the exam as scheduled, but the episode has left a bad taste in the mouths of those who feel that these youngsters’ interests should come first. The community is appalled by recent deve­lopments in Kuantan. To them, the behaviour of some so-called “champions of Chinese education” had threatened to destroy the fruits of labour of former Dong Jong leaders, led by the late Lim Fong Seng, who had made huge personal sacrifices to defend the legitimate rights to Chinese education. The UEC (United Examination Certificate) exam is a national examination managed by Dong Zong, a leading Chinese education group, for the country’s 61 Chinese independent high schools. Lim and other educationists had vigorously lobbied the authorities for years before finally obtaining the official nod to hold the UEC in 1975. Sadly, there are people within the same community who wanted to prevent SM Chong Hwa from holding the exam. And it was because they do not see the school as a “legitimate Chinese independent high school” owing to official conditions put in place when it was set up in 2012. For example, the Kuantan school, which took in the pioneer batch of students in January 2014, is run based on the education system used by Chong Hwa Independent High School in Kuala Lumpur, where students are prepared for both the UEC and the Sijil Pelajaran Malaysia (SPM) examinations. Amid all the noise, it was a great relief when SM Chong Hwa held its first UEC exam on Sunday without any incident. But it was unpleasant that the students sat for the exam amid tight security, with a heavy presence of police and roadblocks leading to the school. The drama started when a small group opposing the present leadership of Dong Zong re-ignited the old debate on whether it was “safe and legal” for SM Chong Hwa students to sit for the UEC exam, as “this could violate 1996 government ruling and undermine the future of the UEC exam”. These arguments are absurd but at the same time, they sound like they are very much in keeping with the law. Unfortunately, it is an overzealous group that pushes these points. If we look closer, these contrarians are mainly the die-hard supporters and associates of Dr Yap Sin Tian and Chow Sow Hon, the former national chairman and deputy chief of Dong Zong. The two men were overthrown last year by the present leaders after an acrimonious power struggle that lasted more than a year. The debate on the Kuantan school holding the UEC was one of the contentious issues then, with Yap and Chow taking a stand against such a move. It was most damaging when three indivi­duals who say they have children studying in Chinese high schools initiated legal action to seek several court declarations. Among others, they want the Kuala Lumpur High Court to declare whether it is legal for SM Chong Hwa to hold the UEC exam. Fortunately, the school’s founders, headed by Tan Sri Pheng Yin Huah, had taken a pre-emptive step by obtaining a court injunction to prevent anyone from interfering with the proceedings of the UEC exam. PETALING JAYA: Deputy Education Minister Chong Sin Woon has assured students of SM Chong Hwa, Kuantan that they will be allowed to sit for the UEC (Unified Examination Certificate) examination this year. He gave the assurance yesterday to allay fears among the students that they might be barred from sitting for the examination in two weeks’ time following claims by Chinese Schools Alumni Association of Malaysia that the school risks putting 60 other Chinese independent schools in jeopardy for holding the private examination, the Chinese press reported prominently today. Early in the day, association president Chen Wen Dat showed the press a letter dated Sept 8 this year from Malaysian Examination Syndicates director Datin Nawal Salleh saying it was an offence under Section 69(1) of the Education Act for the school, deemed a private secondary school given approval to operate in conformity with the National Education Policy, to conduct the UEC exam. Chen’s revelation caused a stir among Chinese educationists as the status of the school had been a bone of contention between two Chinese education groups holding opposing views due to some ambiguity in the school’s approval letter. Acting swiftly, Chong told a press conference in Kuala Lumpur after contacting Education director-general Tan Sri Khair Mohamad Yusof that the Examination Board would be told to void the letter. Khair had, in a letter to the school dated Oct 22, 2015, said the ministry had no objection if the students wanted to sit for the UEC examination. According to China Press, Nawal had confirmed receiving a directive, adding that the board would withdraw the letter immediately. She declined to comment when asked by the daily on the earlier stand taken by the board. “Wait for the board’s press statement,” she said. PETALING JAYA (June 16, 2013): Kedah Dong Lian Hui (Chinese School Committees Association) chairman Tan Kok Hooi has proposed a vote by the existing 61 Chinese independent schools to decide whether the UEC (Unified Examination Certificate) examination should be open to SM Chong Hwa of Kuantan. Suggesting a quick fix for the protracted argument among various quarters concerned with Chinese education, over whether students of the soon-to-be-built school should be allowed to sit for the Chinese independent school benchmark test, Tan said if the majority of the schools say “aye”, Dong Zong (United Chinese School Committees Association) should admit SM Chong Hwa unconditionally. He said in this way, Dong Zong will be absolved of any blame should it later incur the authorities’ wrath, China Press reported today. Tan said in a statement on Saturday that he is worried if Dong Zong opens UEC to SM Chong Hwa, it might be going against the Education Act 1996, which stipulates that UEC is a closed examination meant only for students from Chinese independent schools. If the authorities decide to act and Dong Zong is found guilty, it faces not only a jail sentence and a fine, but the prospect of having to stop the conduct of the UEC, he said, adding that the worst-case scenario would affect the survival of the existing Chinese independent schools. Tan said if the schools vote to allow SM Chong Hwa to conduct the UEC, the school’s board shall apply pressure for the government to amend the letter of approval or to get the prime minister’s and education minister’s permissions for the school to conduct the test. Contentious points in SM Chong Hwa’s approval letter – that Bahasa Malaysia be used as the medium of instruction for lessons that are to follow the national curriculum and that students must sit for public examinations – have Chinese educationists divided over the school’s status. While the pro tem school board said it is a bona fide Chinese independent school, Dong Zong has said otherwise and insist its students will not be allowed to sit for the UEC. PETALING JAYA (May 27, 2013): Dong Zong (United Chinese School Committees Association) deputy president Chow Siew Hon said a new Chinese independent school for Kuantan will not affect SM Chong Hwa, which is being built, as they belong to different categories. He said Pahang is yet to have a bona fide Chinese independent school, which means the “spirit of 520” – a resolution adopted at the May 20, 2012 rally in Kuantan to push for a Chinese independent school there – has not been realised. He was speaking to Sin Chew Daily on Sunday in response to Chong Hwa board chairman Tan Sri Pheng Yin Huah’s objection for any plan by Dong Zong to build another Chinese school in Kuantan as Pheng had said that it will compete with Chong Hwa. However, Chow said Dong Zong and Chinese educationists will not restrict themselves to any town in the east coast state in looking for a suitable site for the school. “Even if we decide to have the school in Kuantan, it will not affect his (Pheng) school as it (Chong Hwa) is a fee-paying private secondary school,” he said. He said the Pahang Dong Lian, which is affiliated to Dong Zong, will hold roadshows to give its take on the controversy surrounding Chong Hwa. While the federation insists that Chong Hwa is a bona fide independent Chinese school and will adopt a “dual-track model”, whereby its students will sit for both government examinations and the Unified Examination Certificate (UEC), Dong Zong deemed it otherwise due to contentious conditions that it must use Bahasa Malaysia as the medium of instruction and adopt the national curriculum. Dong Zong is adamant that it will not allow students of Chong Hwa to sit for UEC. Dong Zong (United Chinese School Committees Association) deputy president Chow Siew Hon said allowing students of a non-typical Chinese independent school to sit for UEC, which is a closed examination, will jeopardise the future of the 60 bona fide Chinese schools. KUANTAN (May 26, 2013): The board of SM Chong Hwa, the new Chinese independent school in Kuantan, is against any move by Dong Zong (United Chinese School Committees Association) to build another such school in the east coast town. Chong Hwa board chairman Tan Sri Pheng Yin Huah said he has no objection to Dong Zong wanting to set up a second independent Chinese school in Pahang as long as it is not located in Kuantan. He was commenting on Dong Zong president Dr Yap Sin Tian’s remark that it intends to seek approval to build an independent school based on resolutions of the May 20 Chinese educationists rally in Kuantan last year. The government later gave the green light for Chong Hwa to be built but certain terms in the letter of approval put the Federation of Pahang Chinese School Management Boards, which is headed by Pheng and tasked with building the school, at loggerheads with Dong Zong. In a press statement on Saturday, Pheng said having another independent Chinese school in the state is not a bad thing but it should not be located in Kuantan or eastern Pahang or pose any form of competition to Chong Hwa, which is trying to get some of the conditions in the approval letter amended. The Prime Minister, who spoke to the cheering thousands who turned up at Stadium Darul Makmur here last night, announced an additional RM3mil contribution from the Government for SM Chong Hwa, whose setting up he described as a win-win decision. He said that allowing the setting up of the school was in line with the national education policy besides fulfilling the request of the Chinese community for an independent school. He said the Government backed the use of the dual track system, with which SM Chong Hwa students would be taught. The subjects will be taught in the Unified Examination Certificate (UEC) format while complying with the national curriculum through Sijil Pelajaran Malaysia (SPM). First-class performance: Guests watching the stunning fireworks display during the fundraising dinner at Stadium Darul Makmur. Inset: Chan entertaining the crowd with a song. KUANTAN: With the presence of Hong Kong superstar Jackie Chan, an astounding RM3mil was raised from the auction of two Richard Mille watches and a painting during SM Chong Hwa’s fund-raising dinner and concert. Each of the items went for RM1mil, putting the total collections at RM13.5mil. Other large contributions came from president of the Associated Chinese Chambers of Commerce Tan Sri William Cheng, Hua Lian Group chairman Tan Sri Ta Kin Yan and the school’s board chairman Tan Sri Pheng Yin Huah. Between them, they donated a total of RM1.5mil for two of Chan’s encore songs. PUTRAJAYA (Dec 31, 2012): Deputy Education Minister Datuk Dr Wee Ka Siong says the ministry has given the green light for the recently approved SM Chong Hwa in Kuantan to use Mandarin as its medium of instruction and for its students to sit for the Unified Examination. According to a report in Oriental Daily News today, Wee said the talk some time ago that the school’s pro team board had rejected the approval letter was not true. He said the board submitted a letter to the ministry stating the type of school it wanted SM Chong Hwa to be, and the ministry gave a positive reply in early December. He hoped this would put an end to disputes over the status of the supposedly Chinese independent school. Earlier, while the board sought to have the approval letter amended, Dong Zong (United Chinese School Committees Association) considered the school as just another national school because the letter said it was to use Bahasa Malaysia as the medium of instruction and to follow the national school curriculum. The Kuantan Hwa Chong will NOT be a Chinese Independent School but a National-type Secondary School. KUANTAN, Sept 22 — The first private secondary Chinese school to be built here is expected to be ready in two years. Deputy Education Minister Datuk Wee Ka Siong said the school would enable Chinese students to study until the Sijil Pelajaran Malaysia (SPM) and Unified Examination Certificate (UEC). “The Education Ministry had approved an application from the Kuantan Chinese Schools Management Board for its construction, on July 26. Will Kuantan Hwa Chong be a Chinese Independent School or a National-type Secondary School? The Kuantan Hwa Chong school, which will be the only Chinese independent school in Pahang, was approved by the government following a 5,000-strong protest led by Dong Zong. It is supposed to be a Chinese Independent School in which students will prepare for the UEC. However, a copy of the approval letter, which has been leaked online, shows that the conditions imposed are for a national-type secondary school. On July 28 Chinese dailies were splashed with headlines on government approval for a new Independent Chinese Secondary School in Kuantan. When interviewed by the press, Ding expressed relief that the new school would be allowed to follow the system practiced by the Kuala Lumpur Chong Hwa High School whereby it could run the Chinese UEC system in parallel with the National Education System. This was confirmed by the MCA president who was the star of the event. The response of another educationist saying that he would only comment after going through all the seven pages of the approval letter triggered off a document chase for the other six pages of the approval letter. For the next 26 days, the Chinese media was fired up with wild guesses, accusations, finger-pointing, name-calling and assumptions of all kinds. But there was no revelation of six pages of the document. On Aug 21, all the seven pages of the approval letter appeared in an online blog revealing that the approval was for a private Sekolah Menengah to be operated in full compliance with the Education Act 1996 which required the medium of instruction to be the national language. There was no mention of the Chinese UEC education system. Protests among the Chinese community once again filled the pages of the media. MCA president Dr Chua Soi Lek insisted today that the recently approved Kuantan Chong Hwa school is in fact a Chinese independent school, not a national secondary school. This comes despite a copy of the approval letter, which has been leaked online, showing that the conditions imposed are for a national-type secondary school. “To me, it is a Chinese independent school. If you want to play it up in the media, you can play it up,” Chua told a press conference in Petaling Jaya this afternoon. According to the leaked letter, the Chinese independent school’s medium of language would be Malay. Furthermore, the letter states that the school must abide by the National Secondary School Syllabus (KBSM) and its students would be required to take the PMR and SPM examinations. It makes no mention of the Unified Examination Ceritificate (UEC), which is the main qualification examination for independent Chinese schools. However, Chua insisted that the Malay language was merely referring to the exams under the KBSM syllabus such as PMR and SPM. “If you want to take KBSM exams, of course you use Malay, if you want to take UEC, then only will you use Mandarin. Whenit was pointed out that the agreement made no mention of UEC exams for the school, Chua insisted that the letter clearly states the approval was based on the contents of the application. “Whatever that was inside the application form, all of them were passed,” he said. ccording to a Sin Chew Daily report, the Kuala Lumpur Chung Hwa independent school’s board of governors vice-chairperson Lim Yew Jin had conceded that there were ‘discrepancies’ between the application put in for the school and what was actually approved. Asked if MCA would help rectify the discrepancies, Chua said the party would make an official comment only after Kuantan Chong Hwa’s board of directors clarified the matter. Chua Soi Lek: Johor’s case is different. The demand for a Chinese independent school to be built in Segamat in Johor is different from that for one in Kuantan, Pahang, which has since been approved by the federal government, says MCA president Dr Chua Soi Lek. “Within the surrounding area (of Segamat), there are two other independent schools. One is in Sungai Mati which is 45 minutes away and another is about an hour away, in Yong Peng. “In the case of Pahang, we felt there was a need for a Chinese independent school because the state is so big and there is no independent Chinese school there,” Chua told a press conference today after the party’s presidential council meeting at Wisma MCA in Kuala Lumpur. He was responding to a 3,000-strong protest in Segamat last Sunday organised by Chinese educationalist group Dong Zong that demanded the setting up of a local branch of the Batu Pahat-based Hua Ren independent school. Responding to the protest, Chua said the group was entitled to hold such rallies under the Peaceful Assembly Act but he put the turnout at 2,000 people. More than 3,000 people today rallied in Segamat Johor to pressure the federal government to allow the revival of a Chinese independent high school in the town. Organised by Chinese educationist group Dong Zong and local Chinese guilds, it is the third of its kind in four months. Held at a field in Kampung Abdullah, rally participants mostly wore red to symbolise their struggle. The event, which lasted one hour, saw two resolutions being passed. Firstly, participants expressed their support for the revival of the Seg Hwa independent school and the establishment of a branch for Seg Hwa secondary school. Secondly, participants urged the education department to respect the board of governors of Chinese schools and allow it to have more say. 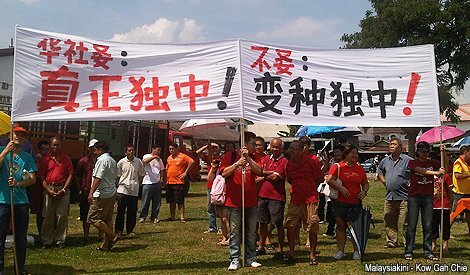 SEGAMAT: Over 7,000 signatures were collected at a rally organised by Chinese educationists here in support of a Chinese independent school to be build here. Various Chinese associations and non-governmental organisations nationwide sent their representatives to the rally held at Kampung Abdullah field on Sunday. Present were MCA leaders, including Jementah assemblyman Datuk Lee Hong Tee. On hand to address the crowd were organising chairperson Ser Lai Hing and Dong Zong chairman Dr Yap Sin Tian. May 20 Rally succeeds: There will be a new Chinese Independent School in Kuantan. Next target: another in Segamat. The original Seg Hwa Independent Chinese High School in Segamat was converted into a national secondary school after the introduction of the Education Act 1961. After the May 20 mega-rally in Kuantan that succeeded in forcing the government to establish an independent Chinese high school in the Pahang capital, Chinese educationists plan a repeat of their feat, this time in the BN stronghold of Johor. Jointly organised by Dong Zong – the umbrella body of the boards of governors of Chinese schools – and Chinese education groups and associations in Johor, the rally aims to gather at least 2,000 people at Padang Kg Abdullah in Segamat on Sunday. They want the government to give the green light to either revive the Seg Hwa Independent Chinese High School or the establishment of a new independent Chinese school in Segamat. “We hope the government will give in to the people’s demands and approve the establishment of a Chinese independent high school in Segamat as soon as possible,” Dong Zong said in a statement issued last week. It called on members of the public to attend the July 29 rally in red clothes, and Chinese associations throughout the country are busy hiring buses to take their members to the venue. The Segamat Chinese community has been demanding a Chinese independent high school since the 1980s. The original Seg Hwa Independent Chinese High School in Segamat was converted into a national secondary school after the introduction of the Education Act 1961. There are now 60 independent Chinese high schools nationwide. They use Mandarin as the medium of teaching and are governed by their own boards of governors. Ipoh Kaya Mob goes ‘amok’! KUALA LUMPUR, July 27 — Putrajaya approved today the building of a new independent Chinese school in Kuantan, more than two months after a mammoth rally in the city and ahead of a repeat this Sunday in Segamat, Johor. Deputy Education Minister Datuk Wee Ka Siong announced today that the new school would modelled after the Chong Hwa Independent High School in the national capital and offer both the Unified Examination Certificate (UEC), accepted by most Chinese education institutions, and the national SPM school-leaving examinations. The move is seen to be a feather in the cap for the MCA, the ruling Barisan Nasional (BN) coalition’s Chinese party, in the run-up to a key general election due soon. There are currently 60 Chinese independent schools in Malaysia, but none in Pahang. Education is a major issue among the Chinese community and is set to be a crucial issue in the run-up to national polls, speculated to be called in September after the Hari Raya Aidilfitri celebration. The MCA, which professes to champion the rights of the Chinese community, had pushed the Education Ministry to fast-track the application submitted by the Kuala Lumpur Chung Hwa independent high school on July 18 after Chinese educationists lead a massive demonstration numbering some 4,000 people in the east coast city last May 20. 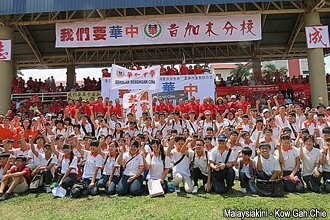 This entry was posted in Uncategorized and tagged Another mega-rally for Segamat Chinese school, chinese education, chinese independent schools, CIS, dong zhong, education, kuantan, MCA, politics, race, Rally for a Chinese school in Segamat, rally for chinese education in kuantan, Segamat. Bookmark the permalink. 2) Lynas fiasco not in Segamat. Hope MCA/BN not that naive to undermind Kuantan’s voters,hoping by that independant school kuantan folks will forget the Lynas issue?? ?